"No speed limits the next 90 min.". A gang of thieves calling themselves the Santa Claus Gang are wreaking havoc, and the police can't keep up. Police Captain Gilbert is distracted by a Chinese reporter writing a story on his squad, and taxi driver Daniel is in the midst of a relationship crisis. 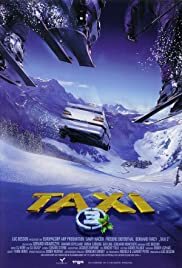 After a string of mistakes in which the thieves outsmart the police time and time again, Daniel and his super-taxi pitch in.